Your baby will eventually learn to sit up, but here are some tips to help him along. Your new baby amazes you. You celebrate every new milestone as you eagerly await the next one. You might also be wondering what you can do to assist baby in meeting these developmental targets -- like how to help your baby sit up. Here's what you need to know about sitting. 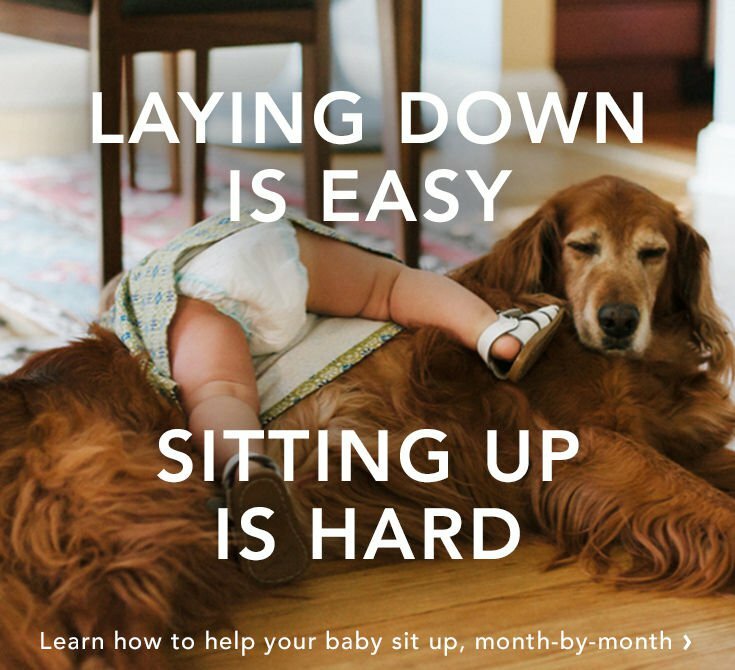 When Do Babies Start Sitting Up on Their Own? Like everything with babies, this milestone can vary. Elizabeth Pantley, an infant expert and the author of the bestselling "No-Cry Solution" series, says, "All babies are unique in their milestones, but generally, at 4 to 5 months of age, a baby can sit with support. By 7 to 8 months of age, most babies can sit up on their own." Not every baby follows the time line, of course. If you're concerned, check with your pediatrician. How Do You Know Your Baby Is Close to Sitting Up? Babies need a few things before they are able to sit up, says Linda Roberts, an internationally board certified lactation consultant and the program manager at Partners in Pregnancy and Parenting. According to Roberts, your baby needs to have control of his head and neck, sufficiently developed back muscles, flexibility in his legs and hips and the ability to use his arms for support. By 2 months of age, he can lift his head at a 45-degree angle for a few minutes when lying on his tummy. By 3 months of age, he can lift his head at a 45-degree angle when lying on his tummy, he may lift his head and chest when lying on his tummy, and he holds his head steady when he's held upright. By 4 months of age, he lifts his head at a 90-degree angle when lying on his tummy and sits with support. By 5 months of age, he raises his upper body on straight arms when he's lying on stomach, rolls over, holds his head steady when he's being held upright and sits with support. By 6 months of age, he sits with some support and rolls over in both directions. By 7 months of age, he sits without support and shifts his body around by squirming, scooting, rolling or otherwise propelling himself on his stomach or back. By 8 months of age, he sits well without support, stands when supported, and shifts his body around by squirming, scooting, rolling, propelling himself on his stomach or crawling. What Are Some Tips on How to Help Your Baby Sit Up? Give your baby plenty of "tummy time." Tummy time should start at around a month old or as soon as he can hold his head up. Tummy time can start with baby on your lap or lying on your tummy for short amounts of time and then can move to a safe place on the floor as he gets stronger. This lets him scoot, roll and learn how to control his body. Pantley says you can place interesting toys just out of his reach so he has some motivation to move. Want more info? Read When to Start Tummy Time With Your Baby. Get down on the floor with him. Seeing you down at his level will make it more fun for him. You can encourage him with excited facial expressions and happy chatter. You can also model sitting for him. Sit him and prop him. Sit him on the floor -- with pillows around his sides and back to support him -- starting at about 4 months, as long as he is able to strongly support his own head. Reaching for the toy strengthens the muscles he needs for sitting. But be there to help. "A parent always needs to be right there for support," Robert says. Sitting is not something your baby actually needs to be taught, reminds Pantley, but you can certainly help the process along. "You just need to allow plenty of time for your little one to develop his muscles and to learn how to use his body," she suggests. What Should You Avoid When Helping Your Baby Learn to Sit? Let your baby have some space to move his body. You can use a baby carrier, time on a soft mat on the floor or a safe place such as a crib. "Babies need to have an opportunity to use their body in order to develop physically," says Pantley. Too much time in infant seats, swings, car seats or other holders can delay a baby's physical development, she explains. Keep your camera or smartphone charged and handy. Your baby will be sitting, crawling, running, dancing and soaring through life before you know it -- whether you're ready or not! For more on these exciting developments, check out When Do Babies Sit Up? Rachael Moshman, M.Ed., has two decades of experience working with young children and their families. Her graduate work focused on infant and toddler development.